Opening night of Judith Thompson’s The Crackwalker, playing at the Factory Theatre, was one of emotion: like every emotion that human beings can feel and some I might have felt for the first time. I laughed, I was shocked, and I was reflective. At some points I wanted to jump on stage and either comfort the characters or cuff them on the back of the head. Needless to say, I didn’t. However, Theresa, Sandy, Joe, and Alan are characters that are so hopelessly flawed that they can’t be anything other than real. We know these people. They are our friends and our family, and that is why this show is so great. It is rooted in reality and elicited a real, visceral reaction in me. I will save my essay on the sociological aspects of The Crackwalker for another time and stick to reviewing the show. The Crackwalker gives us the story of Theresa, a “slow” but energetic young woman with a questionable moral compass. Theresa loves Alan and Alan loves Theresa. The only part of Alan’s life he seems in charge of is his relationship with Theresa. Joe and Sandy, friends of Theresa and Alan, are perfect candidates for couples’ counselling. There is a love between them, but between the booze and the beatings it is hard to see, even at the best of times. Then there is The Crackwalker, who flits about the foursome pulling imaginary strings so that I was questioning whether or not these characters are not simply a projection of this mysterious man. The performances here are key and each deserves special note. Claire Armstrong holds nothing back in playing Sandy. She is hardened not just by her relationship with Joe, but with her life in general and from the opening Claire sells this. Even in Sandy’s nurturing moments, Claire keeps herself centred on Sandy’s core traits which gives the character its realism. Yolanda Bonnell’s Theresa appears simple at first, though in reflecting on the show I feel she is more of an enigma. I kept asking myself, how did this girl get to be this way? What the hell happened? Bonnell plays Theresa with a light that assuages the massive amount of sympathy one should feel for Theresa, as I felt that no matter what situation this girl gets herself into, she will always, somehow be okay. Joe is the character I wanted to knock out with more than one kick. I feel this is a testament to Greg Gale’s portrayal. Even in his lighter moments, the darkness inside Joe was always simmering. Gale nailed this with a simple glare early on and didn’t lose steam. Stephen Joffe gave us a multi-layered Alan who really came into his own near the mid-point and in the second half of the show. I would argue Joffe’s performance was the standout. He starts as a happy-go-lucky “country boy” but devolves over time into a tormented and tragic wanderer. 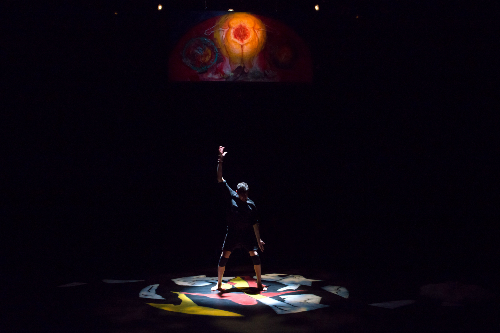 The Crackwalker character played by Waawaate Fobister was a dynamo of movement and Fobister commanded attention each time The Crackwalker graced the stage. I was somewhat at a loss to the ultimate role of this character but was impressed by Fobister’s commitment to its physical demands. All of these performances come together under the guidance of acclaimed writer and director Judith Thompson to give us an engaging and engrossing night of theatre. The Crackwalker is not a show for the faint of heart, but it is the very definition of committed performance and deserves to be witnessed by as many people as the Factory can hold. If gritty realism is your preference, check out The Crackwalker in all its glorious grime.